Along with other things of my childhood, Four Mile haunts me. I love to see those familiar barns, homes, and turnoffs, the old country store, the old fences, the far-off timber that turns feathery and transparent in autumn. The prairie is typical, Midwestern landscape that one finds off the interstate, but for me it is more. It is also my “essential thing” which has changed slowly overtime. All flesh is grass, and all its beauty is like the flower of the field. Four Mile has also been my deepest link to my family’s heritage upon the landscapes of my home. I remember being shown so many times, where things used to be along or near 185. I knew the location of the family peach orchard of 40 years before, the place where Harold found over six dozen morel mushrooms, where the mail came to the farm by team in winter, where kin had lived in the early part of the century, where their barns had stood. 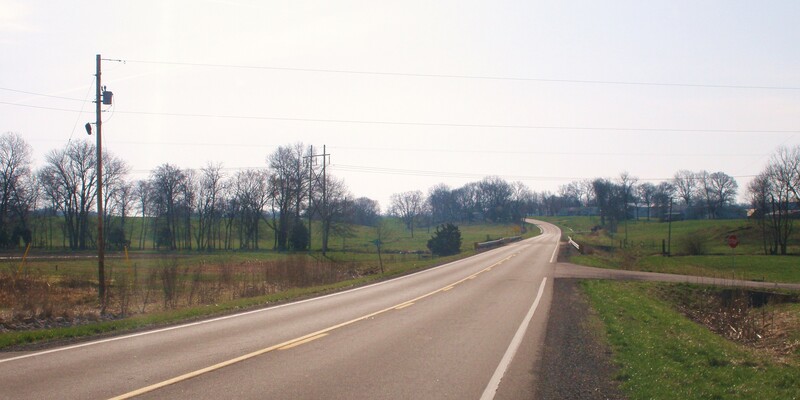 Besides Four Mile, I had notions of where my father’s kin had settled in the hills of northern Fayette County, for Dad reminisced about his family during our trips north on U.S. 51 to visit his aunts Pauline and Peg. Thus, very early I sentimentally confused family ties, and rural midwestern geography along old two-lane roads. I was told that one ancestor, Winslow Pilcher, had owned the land first but that another ancestor, Josiah Williams, had formally deeded the property as a cemetery. The graveyard was located in a bright meadow surrounded by thick timber. A single massive oak stood in the clearing. A few houses have since been built along the gravel lane, but for many years the graveyard was indiscernible through the trees. We could see no houses and hear nothing except sounds of nature, our own voices, and the slam of the car trunk as the adults removed the “decorations” and then placed the flowers on graves of my grandfather and other relatives. My grandfather’s monument was red granite. It read, simply, “CRAWFORD Grace 1890- Josiah 1886-1954.” To each side of the stone were the graves of my mother’s grandparents: John and Susan Crawford and Albert and Abbie Pilcher. Grandma had a picture of Albert’s stone—an impressive gray stone and one of the largest in the graveyard–as it looked before Abbie’s “1949” was set thereon. The date was carved from the raised bar which followed her birth year of “1869” once Abbie had lived the unhappy remainder of her life. A vigil lingers around these kinds of stones, a waiting for a person’s open-ended life, symbolized by a mere hyphen, to provide a date of closure. It is as if the stone abhors an unfinished life. As a child I did not understand such a thing. In fact, the old section of the cemetery intrigued me most A new stone, so plain, solid, and unfinished, seemed less interesting to me than some falling marker which carefully tallied the person’s exact age at time of death and contained odd names like Comfort, Alonzo, Mortimer, Elvina, Reuben, Ulysses, Tabitha, Jahiel, and Eudoxy. A few of the old stones had fatalistic inscriptions. Others had more explicit promise of a greater peace beyond. Waiting waiting when the Lord shall come. A hymn carved in stone in a beautiful meadow, where the shadows of oak leaves played upon new grass. Each year a Williams descendent places flowers on her grave. Eventually I learned I am her descendent too. The cemetery was a place of lonely peacefulness. Every year, too, the adults interrupted that peace with remarks about the peacefulness, about how long that tree might have been growing there, about how badly Cousin So ‘n’ so said he misses his wife (who’s buried over there) when we last saw him in Tri-City, about why Cousin Such ‘n’ such hasn’t been out with flowers because she’s usually decorated by now, about how old Grandpa Crawford would have been (” 196- minus 1886 is — so he’d be —”). Sometimes we’d arrive in time for a trustee’s meeting beneath the oak and the grownups would talk about how much mowing costs had been last year, what kid was going to be around this summer who could be counted on to do trimming, and…on and on. Mourning doves made their haunting call. These are childhood memories, tenacious as any, but all the more fond, perhaps, because they join with those of Grandma’s farm, and they also provided me a kind of lesson in history which, only after several years, I put to good use. Memorial Day marked the beginning of summer. My summertime memories are local but no longer strictly chronological. I remember proudly checking out books on science from the library; the retarded man named Mark who walked around downtown all the time and greeted everyone with a smile and hello, and led every parade; the crowded Saturday afternoons on Gallatin Street as I went with my parents to one store or the other—the lumberyard, the Purina store, the clothing stores—thoroughly ashamed to be seen with them. I was in junior high and my hormones were right on schedule. I remember popular songs which variously filled my mind as I walked the Illinois Central tracks home: “Good Morning Starshine,” “A Day In the Life,” “Incense and Peppermint,” “Low Spark of High-Heeled Boys,” “Tumblin’ Dice,” “Purple Haze,” “Bridge Over Troubled Water,” “Out In the Country,” “25 or 6 to 4,” “Get Together,” “Levon,” “Reelin’ in the Years,” “Where Have All the Flowers Gone,” “Eve of Destruction,” “Come Saturday Morning,” “Closer to Home,” “Aqualung,” “Stairway to Heaven,” “Locomotive Breath,” “Break On Through to the Other Side,” “Gimmie Shelter,” “Baba O’Reilly,” “After the Gold Rush,” “Holly Holy”. . .
During my childhood the Sixties era hung like psychedelic drapery among the more muted but still colorful tones of the pioneer, Victorian, and world war eras of downtown. The Carson’s dime store sold Beatles memorabilia and tie-dye bubblegum. Mom brought home issues of McCall’s, Look, and Life from the library and the models had flowers in their hair and their bell-bottomed clothes. Pictures of Apollo VIII appeared on books and magazines. I think of these things, sentimentally perhaps, in terms of summertime and the freedom to do and be what you wanted. In those days I had several summer hobbies. On St. Louis trips Dad patiently took me to the stamp department of Famous Barr. Another summer I liked numismatics and eagerly sought oddities among Lincoln Head pennies. I saved all the “wheat” pennies in change and was overjoyed to find one with no obverse. When we visited the old Four Mile Store I’d save interesting bottlecaps which had been discarded in the parking lot. Rocks and minerals filled my time another summer, butterflies the next. One summer I stayed with Grandma and copied lines of music from Peanuts comics, in collections of strips that Mom bought me at Vandalia’s old Rexall. Another part of me wanted to be a writer, and I looked at poetry with interest. I was briefly interested in collecting beer cans, a hobby I remember less for the brands than for the hot days of exploring the trees and streams within Vandalia’s city limits. In one sense I was a busy kid because I was bored and lonely—an only child eager to please my parents who were, in turn, eager to encourage me. In another sense, I think my parents’ memories of the Depression made them give me freedom to find a satisfying work. Thus free, I surveyed the sunny, small cosmos in which I lived and found plenty to interest and engage me, although, paradoxically, Vandalia nurtured me amidst my boredom. I had psychological space in which to grow. History almost “won out” among my hobbies. History was “happening”–it was the Sixties, after all. I can scarcely recall my family’s big “get togethers” at Grandma’s house without recalling things they talked about around the house and farm: Ho Chi Minh, George Wallace, Dean Rusk, Bernadine Dohrn, Spiro Agnew, Kent State, John Birch, Sharon Tate, Martin Luther King, ABM, ICBM, General Westmoreland, escalation and Vietnamization, Bobby Kennedy, “war in the streets,” Martin Luther King, the Silent Majority, “love it or leave it.” In that farm house, built when Teddy Roosevelt was president, the view of history was fantastic. But my interest also had to do with downtown Vandalia and Four Mile. At some point, the obvious and overlooked features of downtown stirred in me an interest and a longing for the past. In sixth grade I’d walk to town after school to get a haircut and, idly standing under the awnings of the Hotel Evans during a cold, autumn rain I’d look at the cornices upon the old commercial block. They had names of “old time” Vandalians. I’d ride my bike to the South Hill Cemetery and see the nineteenth century tombstones sweep that hill like proud beacons from the past. Andy Stroble’s stone was there. On some of my errands I’d read the several sidewalk plaques which the local historical society had placed at the site of capital-era buildings, or instead of looking through the science books I’d survey the many Lincoln biographies at the library. Other times I’d notice mundane things like bridges across the town branch, remnants of concrete pedestals where filling stations had stood, broken sidewalks from previous years—one sidewalk was dated 1914 and contained the names of Vandalia’s mayor and aldermen–forms of local architecture, old signs for “Rail Road Crossing Two Tracks” and U.S. highways, and the remains of U.S. 40’s realignment across the river. Still other times, as I have written, Mom and Dad reminisced about the furniture stores, groceries, tobacconists, saloons, highway garages, coffin dealers, and jewelry stores that had operated downtown during the 1920’s and 30s. Anything old and well-used, anything preserved from the past interested me in a general, unfocused kind of way. And I liked the old biblical maps and ragged religious books at our church and I liked the family cemetery and I liked Grandma’s house and her Pilcher family history and her old household items close at hand. All my acquaintances with history sentimentally converged. Eventually I went on to study theology, and perhaps I did so because I liked local history first: if this life is so filled with old, dear things, what must eternity be like? What is older, more dear and close than God himself? I became interested in genealogy late in 1969. During a unit on heredity a seventh-grade science instructor assigned us to trace our ancestors as far back as we could. Overjoyed to find a new hobby, I proudly began the assignment with myself—Paul Edward Stroble, Jr., born in Vandalia, Illinois on Wednesday, January 2, 1957 and not yet deceased (nothing right of the hyphen)–and added my parents, Paul and Mildred (Crawford) Stroble, and then my grandparents, Andy and Janie (Carson) Stroble and Joe and Grace (Pilcher) Crawford. With my parents’ help I added my great- grandparents (Grandma Grace knew of some other ancestors–her own grandparents—so for my original project I could go back as far as my maternal great-great-grandparents. But the basic chart wasn’t enough; I did not have many lifedates. So I begged Dad to drive me to the Pilcher Cemetery and as he kept the motor running I trod through a light blanket of snow and carefully copied inscriptions into a little notebook purchased from the Ben Franklin. I also copied names and dates from stones in that smaller, unused graveyard. We returned to town and Dad drove me to his father’s grave. That may have been the first time I heard the story of how Grandpa died downtown. I copied Andy’s dates. Then Dad took me up the hill and showed me two graves I’d never seen before: his maternal grandparents, Mac and Alice Carson, who had died many years before my birth. Next to their graves was the 1909 stone for Dad’s young great-uncle. Dad told me that, while duck hunting in a boat, he had stumbled with the gun and it went off and killed him. It was a sad and terrible story but I was a twelve year old boy and therefore enjoyed the horrific. I don’t remember what grade I received for the heredity assignment but the original reason for my work was soon forgotten. For the next five years, mostly during summer vacations, I pursued genealogy and discovered all I could about our family’s history. It was a local hobby; I rarely left Fayette County. The generations of our families had been there for many years. My father’s side of the family was either difficult to trace or already researched. Dad was 44 when I was born, most of his uncles and aunts were deceased by the early 1960s, and so many of the generation’s stories had been lost. Not enough information remained to trace that line back to Bavaria. As for Grandma Janie’s side, I knew more. One branch had settled Fayette County in the 1830s while another settled Sangamon County, Illinois in the 1820s then came to Fayette County as well. My father’s uncle Roy Carson, a genealogy enthusiast for many years, had traced the descendents of the various branches and shared his material with me. Then there was Mom’s side. Talking to Grandma Grace and consulting her 1891 county platbook and the old Fayette County histories, I was thrilled to learn for the first time that my maternal ancestors had all settled in the same general location— which, as I wrote before, was Four Mile Prairie and the old Vincennes Road (185). Ancestors who came from Virginia, southern Ohio, New England and Kentucky had arrived at the prairie during the first wave of local settlement in the 1820s and 1830s. The National Road terminated at Vandalia in those days, and some of the families came to the county via that highway. With a commitment that pleases me today, I copied tombstone inscriptions, wrote to state historical libraries, and found census records. I gratefully accepted old pictures from relatives who knew I’d keep them safe and not (in one lady’s phrase) “take them out and burn them.” I found wills and probate records in the county courthouse. I watched the mail eagerly to see if a distant relative had sent me new information. I obtained family information from my cousins who good-naturedly tolerated my naïve enthusiasm to inquire of their age. From old county platbooks I found locations of ancestral properties and reread with eagerness the stories in the Pilcher history. I no longer remember when I discovered particular genealogical tidbits. But I recall the sense of wonder and excitement as I built my “tree” with the names, stories, and in many cases the photographs of my ancestors. Too, I recall feeling a sense of reverence as I stood at particular tombstones which, I’d discovered, marked the graves of ancestors and when I realized that particular fields near 185 were sites of ancestral homesteads. In addition to its locality I liked the difficulty, mystery, and lore of genealogy. People who trace families know that an entire branch of a family may be missing due to a name omitted from a will, an abraded tombstone, or the want of one more source. Sometimes a family may be so vast that tracing it becomes impossible. Grandma’s maternal grandfather was one of seventeen children and merely tracing his descendents by three wives look several summers. I heard family stories which could’ve been truth or lore, for instance, one relative told me an ancestral family was intermarried with the Cherokee tribe, but could no further information. According to family lore one Pilcher ancestor was first cousin to George Rogers Clark but we lacked the previous generation to know for sure. Unfortunately my research disproved the legend, and my claim to fame was fleeting. But I learned more truth than legend. Inspired by the Pilcher history to dabble in genealogy, over the years Grandma had collected material for a Crawford family tree: clippings, photographs, letters, funeral parlor keepsakes, turn of the century obituaries; she owned a large quantity of cancelled checks, receipts, credit slips, and Sunday school announcements which her father-in-law, my great- grandfather John Crawford, had kept in a rolled oats box. Grandma even had a lock of hair from the head of John’s mother, who died in 1921. Grandma also had many old photographs of kinfolk—hilarious pictures in a way, since no one in the 1800s smiled at the camera. But she had never found time to do a Crawford history and seemed pleased I wanted to help. By the summer of 1971 we mutually resolved to compile the descendents of Paul and Susanna (Straub) Crawford, my great-great- great-grandparents. Susanna had been the widowed pioneer who settled Four Mile. Our plan was to write the history and then to place the material with each family branch to form a kind of family scrapbook. At the time I thought that was terrible. Now I think, how like many of us; too brusque and too busy. Grandma knew that one great-great-great-uncle had married a young woman whose health was poor. He was known as a great whistler, Grandma said, and so once when he cut his foot badly, he did not want to shock his wife, so, bleeding badly, he entered his house whistling. She knew that our cousin, Lewis Crawford, for whom the local American Legion post was named, was a religious young man torn between enlistment in World War I and the care of his widowed mother. He saw his Brownstown friends go “over there” and felt that he should go too, and he died in France of influenza. She knew that my great-great-grandfather Andrew Crawford had been killed in 1880 at Four Mile by an overturned farm implement; a spooked horse threw him and the wheat drill’s lever struck him in the stomach. He died after a few days, for no doctors lived nearby. She knew all the family stories that I’d heard along Route 185: the field where Andrew had been killed; the places where my ancestors John Crawford and Jonathan K. Pilcher had lived. She knew that my great-great uncle Will Crawford had lived in the very same house all his life, and died in the very room in which he was born. She knew that a certain ancestor, John Mahon, was buried in a roadside graveyard beneath a plain rock, for he had wanted no more ostentatious a marker than had Jesus. Family stories. I wrote them all down, enthralled. We began to organize all the photos, clippings, funeral notices and other items according to families. Some of the oldest, locally-published obituaries of Crawford and Pilcher cousins were very quaint. Here are two. Grandma and I got closer during that time. We also talked politics, because the Vietnam War seemed to have no resolution and she deplored the fact that a Republican succeeded her beloved LBJ. Sometimes Mom drove us to Brownstown where we’d visit older relatives and gathered their stories. I discovered that many older people have remarkable memories Grandma Grace’s memory was clear to the end. I remember one afternoon in 1971 we were looking through the old Fayette County history. “George Sandage!” she exclaimed excitedly. I looked at the picture. The man, a prominent local person, had a long wavy beard and very clear eyes. The adjacent biography stated that he died in 1904. Grandma was fourteen that year. I’m sure, from how she talked, she’d never seen a picture of him since. As it happened, I had many of our materials at my parents’ house when the fire happened—photos, clippings, the Pilcher family history, the 1891 platbook, even the lock of my ancestor’s hair. Having inadvertently saved the material from destruction, I knew I had to persevere with the project. Grief necessitated the pursuit of truth: I had to make something lasting from the work which Grandma had started. The origin of the Crawfords was shrouded in enough mystery to keep me persevering. Susanna was a “Pennsylvania Dutch” woman from Lancaster Co., Pennsylvania; the Fayette County census indicated that she was born in 1809. According to Grandma, Paul Crawford had been killed by Indians in Ohio in the 1850s and Susanna had then emigrated to Fayette County. No one knew where he had died, though. Was it in a known location? Was it en route to Illinois? Was he buried somewhere or left for dead as his family escaped the attack in their wagon? No one knew. (The story is surely folklore: most Indians had been driven from Ohio by the 1850s.) Susanna and Paul had eight children, all of whom grew to adulthood and seven of whom settled at Four Mile along with Susanna. The other son was a Baptist minister in Central Illinois; I knew very little about him and did not expect to find leads. Susanna’s grave was entirely unknown. Grandma was sure it was in the Pilcher Cemetery but no one knew where or even when she had died. Family tradition said that she had “taken sick” at a church quilting and soon after died, but when? Why did no one erect a stone for her? (As one wag in our family said, who knew that church quiltings were so dangerous?) Searching public records proved futile. But besides these mysteries the family was not difficult to trace. 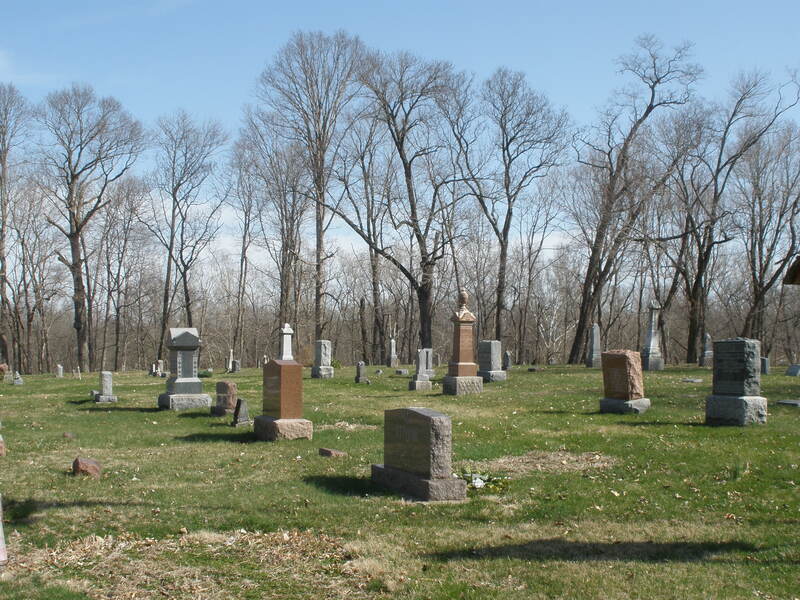 All the seven were buried in more or less continuous line in the meadow of the Pilcher Cemetery. One grave was unmarked but Grandma possessed the man’s obituary from a 1904 Vandalia paper. Thus with one visit to the graveyard I obtained the lifedates of most of the first Fayette County generation. From Grandma’s material I could pursue leads and know whom to contact for more recent information. Some of the joys of adolescence attend my happy memories of genealogy. It was a time of my life when popularity, girls, rock music, and getting a tan ranked high among my priorities. Once licensed to drive I happily used my freedom to finish the research—including a search for “missing” relatives’ graves in local country graveyards—without having to be chauffeured around the county’s backroads. It is a minor thing, perhaps, but an essential aspect of my discovery of the pioneer generation was “filling up,” and I carried into my genealogical forays the smell of fanbelts and tires hanging from the ceiling of the local Mobil station, and the sight of the red Pegasus symbol, and the smell of “regular” upon my hands. Free, easy, and usually barefooted, I set about the work. I liked to make my drives in the morning when the heat hadn’t climbed high and the light was soft on the leaves. I liked blending the historical with the familiar as I passed highway sights I knew best: the oil wells, gas pumps, and New Deal trees along 40 and 185; the country churches, the fields which stretched toward timber, the country stores and farmhouses. At the cemetery I took notes of nearly-obliterated inscriptions—some too gone for even pencil rubbings to pick up. With my mind filled with Neil Diamond songs I took pictures of Four Mile places Grandma had showed me a few years before. I went hiking across tilled fields in search of gravestones or homestead sites and, in a reversal of my childhood whining, I was loathe to go home. The work finally wound down. I had found many descendents of the original Fayette County branches when a distant relative in Utah wrote me. I hadn’t known him or heard about him. But he stated that Jacob Crawford, the son who did not settle at Four Mile, was his great-grandfather and that he had traced all of Jacob’s descendents but knew little about the families of the other seven Crawford children, His genealogical dilemma had been exactly opposite mine, and he and I turned out to be each other’s last, best lead. It was a windfall of spectacular proportions. Most exciting to me was that he knew about Paul Crawford’s ancestry and his lost grave. Paul had died in1849 and was buried in Waldo, Ohio beside his father, William. William himself was the son of a Scottish fanner named James who’d settled in central Ohio. Guided by my relative’s description of the place, I finally traveled to Waldo and found Paul’s blank, broken stone in the place beside William’s readable marker. It was so much more than I had ever had, and I was grateful to stand at their graves. Yet one mystery remained unsolved. While driving Four Mile near Grandma’s farm I was always intrigued by the spread of thick roadside timber where Susanna Crawford had homesteaded. Her church still stood along 185 too. But I felt frustrated that I could never locate her grave at the old cemetery. I wanted to stand at her grave too. After several months of note-taking, copying, and sitting in my hot, non-air-conditioned bedroom typing by the “hunt-and-pick” method, I completed the Crawford history. Sunlight from the yard brightened my room as I typed and listened to my LPs. Later, I produced slick, gray photocopies for distribution to relatives. In the manner which Grandma and I envisioned it I also put all the Crawford memorabilia together into huge scrapbooks, which I have always kept close to our family’s agreed-upon fire exits. Now I leaf through all these pictures and clippings the way some people leaf nostalgically through their high school yearbooks. The work validated an enjoyment of research and intellectual problems–and a willingness to spend my energies on something beneficial to others — which have never left me. But although relatives often write me for genealogical information, I haven’t pursued the hobby for many years. The following summer I went off to college and eventually graduate school and beyond. And genealogy was, for me, a spatial rather than temporal thing. In genealogy one scarcely makes reference to concurrent national history; instead one speaks of branches, leads, paths, lines, dead-ends, and although I later became more historically conscious this informal, “spatial” imagery appealed to me greatly. It was as if each “branch” of my family had its own invisible but felt space, just like, as I might have associated it, a particular road on 185 had its own space, or a parcel of timbered land owned by a remote ancestor, or a room in Grandma’s beloved, destroyed house. I wanted to go to a distant destination as if to an apex of a two-lane road, but I could not, because the destination was the time of my forebearers and it had passed away, leaving me haunted by the rural geographies which we, my relatives and I, had shared. But I still travel the region, allowing space and time and the sense of place to mingle in my mind. I remember one genealogical discovery, more for what I felt than what I found. A graveyard was shaded by tall trees. It was on the road to Grandma’s farm, a way which, I realized, had been transformed. I had a name and birthdate for a distant relative, but little else. One day I found her legible stone beneath a great oak. After I photographed the grave I walked around the yard and felt deeply moved by the plain landscape, the quiet sounds, and the memory of Grandma. Across the minimum of fence the field was yellow and unharvested; sunlight lay across it. The lonely sound of mourning doves drifted across the field. The sky and earth looked soft, like the pastoral scenes on Grandma’s Sunday school literature, symbolizing God’s tender care. To the north I could hear and see traffic on 1-70. An overall-clad farmer drove his tractor half on the shoulder and half on the two-lane and didn’t see me wave as he bumped along past shade trees and farmhouses. Thick timber grew, faded for the distance, upon the horizon as if planted by a long-ago gardener. Beneath the midwestern sky, I stood among the mossy antebellum stones, among the buried dead and, in a sense, among those pioneers who left their dead behind. The country graveyard was surrounded by a field that stretched to timber west and east and to highways north and south. I knew a thousand sights along both roads. I knew the ancestral plat of this land, and the plat lay across us all. History seemed a warm embrace, like the green far-off timber. The distant passage of traffic sounded like time, indifferent and confusing yet at the same time comforting. I wanted to be, with all due humility, omniscient in just this respect: I wanted to know every story for each farm fronting every road, to know all fields and roads and stories, to know each poor soul like me who couldn’t tell any longer between the memories of a happy home, and the way there. On this era, I enjoyed William Machester, The Glory and the Dream (Boston, 1974), especially chapters 31-33. The two Thoreau quotations are from Walden, “Economy” and “Where I Lived, and What I Lived For.” See also the History of Fayette County, Illinois (Philadelphia, 1878), and Robert W. Ross, History of Fayette County (Chicago, 1910).